The Downtown Spokane Public Library features a wide array of programming — and an incredible view of the river. We're not entirely sure how many children vote in our Best Of the Inland Northwest poll — in the interest of democracy, we don't impose age restrictions — but we can confirm that the accolades earned in the Kids and Family category are highly sought after. And these awards also don't go unappreciated, either. At WHIZ KIDS on the second floor of River Park Square, Jan St. George has a special love for her pint-sized customers, and is grateful that they honored her as the region's top toy store. "When kids of all ages come into my store, I hope they have fun. I hope they open themselves up to exploring something new to them," says St. George, who stocks a balance of educational and just-for-fun toys. She aims to sell long-lasting toys that kids will have more than a fleeting attachment to, while also looking to provide items that run the gamut. While the Best Of win is a telltale sign that St. George is doing something right, there's another way she knows when she's on the right track. "When it's time to leave and a kid cries, it breaks my heart, but is also a compliment that they don't want to leave my store," she says. There are myriad choices when it comes to picking a preschool in the Inland Northwest, and selecting one is no easy process for parents sending their children off to the classroom for the first time. Teri Finch, owner and director of LIBERTY LAKE CHILDREN'S ACADEMY, is well aware of that, which is why she says she's hired a staff that sets the school apart. All of her lead teachers have degrees in early childhood education or child development, and are invested in the lives of these young children. "We believe at LLCA to be successful, the first thing to do is fall in love with the work you do," says Finch. The school's curriculum includes learning through discussion, observation, creativity and play, among other areas. "The best part of teaching 3-to-5-year-olds is watching the growth in all the areas of development, and seeing children experience the first love for learning new things," says Finch. 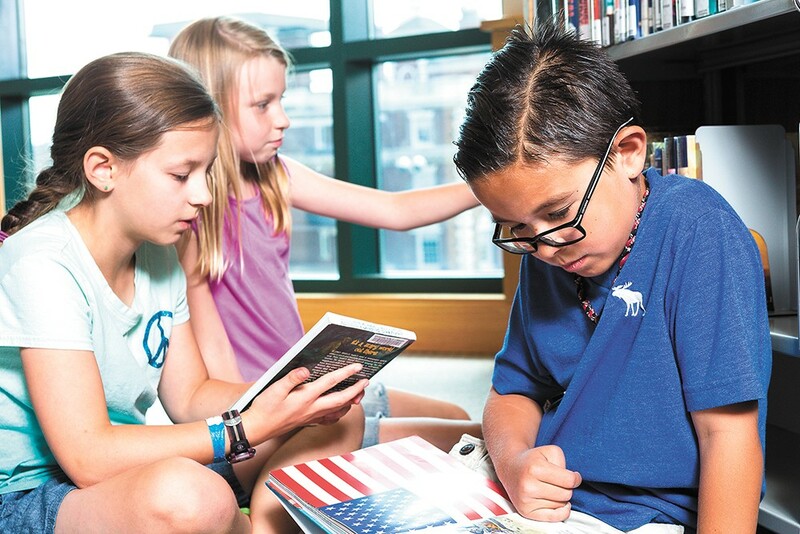 If you've been inside any of the Spokane-area libraries, you'll see that kids seem to have taken a cue from the region's literary boom by diving into books of their own. The DOWNTOWN SPOKANE PUBLIC LIBRARY, with its view of the Spokane River, knows how to accommodate kids and families with an array of programming, ranging from the popular Storytime for Toddlers on Tuesdays and Fridays to STEM-related programs for older kids, including a basic computer programming and coding class. That's why they've been voted Best Library. Families can also gather for music and movie programs. "Every day our staff works passionately toward providing high-quality education opportunities for all. It's such a validation to see this hard work recognized by the community," says Amanda Donovan, Spokane Libraries' communications manager, of the Best Of accolade. And if you're wondering what the kids are reading these days, they've got you covered. "Kids ask me for Elephant and Piggie by Mo Willems all the time," says Sumi Shadduck, children's librarian at the downtown library. If you're an adult reading this and you thought that laser tag had been left behind with all your other early-1990s obsessions, it's time you realize that Spokane has an entire warehouse dedicated to the game. LASER QUEST, it should come as no surprise, is this year's Best Place for a Birthday Party — because... again, it's freaking laser tag. General manager Chad Cottier says that the downtown warehouse of good times hosts upward of 600 birthday parties a year. So yeah, they know what they're doing. "We try to treat the birthday person very well from the minute they arrive until the minute they leave," says Cottier. "We also try to make parties as easy as parents want them to be. We can order pizza for you, or you can bring in your own food if you prefer that." And because you've been wondering — yes, adults can get in on the laser tag action with the kiddos. The enormous milk bottle out front is probably draw enough for your kids, their faces plastered to the car window in awe as you cruise down Garland Avenue. But when you get inside MARY LOU'S MILK BOTTLE, you realize that the family atmosphere found here is hardly a novelty. Neither are the milkshakes, which took top honors in this year's poll. Mary Lou's offers more than 25 different flavors and styles, ranging from the basic (vanilla) to the experimental, like the River City Sludge, which combines chocolate ice cream, brownies and hot fudge into a straw-collapsing concoction. For kids pursuing their love of music in the Inland Northwest, one name looms large — HEATHER MONTGOMERY. Not only is Montgomery the conductor of the Spokane Youth Symphony, the illustrious ensemble that's known for developing promising musicians, she also teaches music at Sacajawea Middle School and Roosevelt Elementary School in Spokane. For Montgomery — who was inspired to pursue a career in music education by her mother, who was also a music teacher — music education is more important than some might realize. "Music has been shown to benefit students' brains in a variety of ways, it's a fun group to belong to, and it looks great on college transcripts, but that's not really why we make music. Kids should sing and play music because it's part of being a human being," says this year's Best Music Teacher. And if she's not sounding cool enough already, Montgomery is also known for contributing violin and vocals to the popular indie-folk act (and Best Band winner this year) Folkinception.